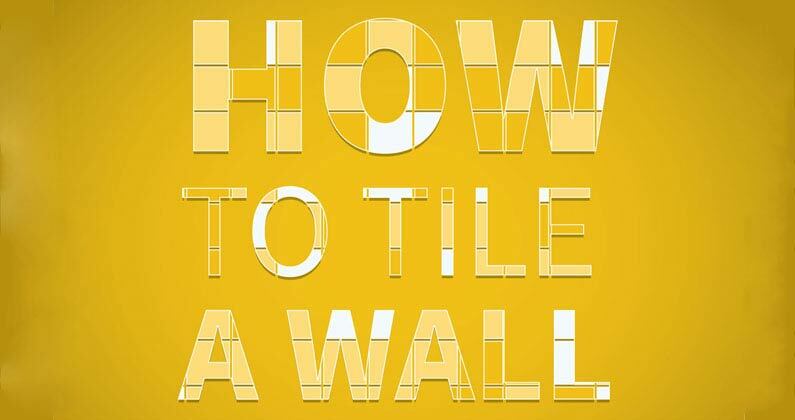 You can mark out how you are going to tile your wall by using two wooden battens. 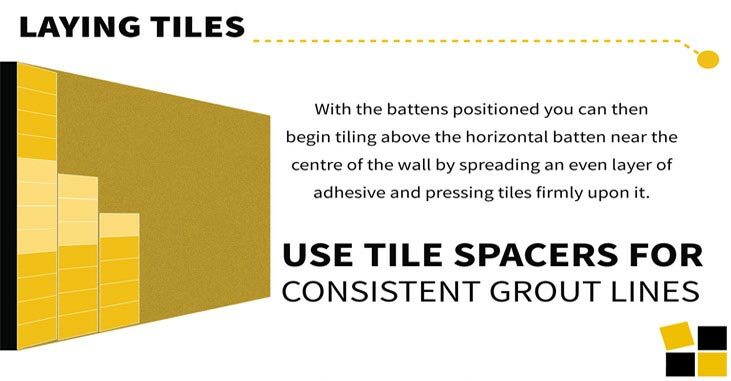 Firstly lay your wall tiles out on the floor in a single row with tile spacers. Lay the first batten alongside the row of tiles and mark the position of the tiles on the wood with a pencil. Ideally you want the cut tiles at the top and bottom of the wall to be of similar length. To achieve this, place the batten vertically against the wall and mark on the wall where you want your first row of whole tiles to begin. Adjust the batten to ensure an equal gap is also left from the last row of whole tiles near the top of the wall to the ceiling. Then nail the vertical wooden batten to the wall with a hammer. Don't hammer the nails in too far as the batten will be removed. Use a spirit level to make sure the batten is level. If you are using square tiles then the same measurements can be used on the second batten to work out the cuts horizontally at the edges of the wall. If you are using rectangular tiles then mark out the second batten accordingly and nail this to the wall horizontally next to the vertical batten to create a right angle. Use the battens as your guidelines and begin tiling from where the inside corner meets. Spread the adhesive on the wall before twisting and pressing the tiles into place. Tile in horizontal rows across the wall, ensuring the tiles are straight with a spirit level. If necessary measure up from the bottom of the wall to the bottom row of tiles every few tiles with a tape measure to make sure the tiles remain at an equal distance. 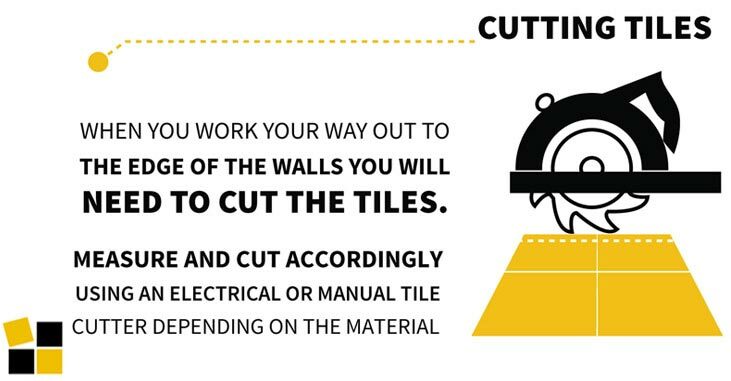 This will help you when it comes to making cuts to tiles. Once you have laid all of the whole tiles on your wall let the adhesive set for 24 hours. During this time you can make cuts to fill in the gaps around the edge. Remove the tile spacers before the adhesive is fully set to make sure they do not get stuck. Wear protective glasses and gloves when making cuts to the tiles. The wall tiles you have chosen should be cut with an appropriate tile cutter. A manual tile cutter can be used for porcelain and ceramic tiles. For natural stone it is recommended you use an electrical wet saw to cut the tiles. Once you have cut the tiles to size then begin tiling around the edge of the tiled section. 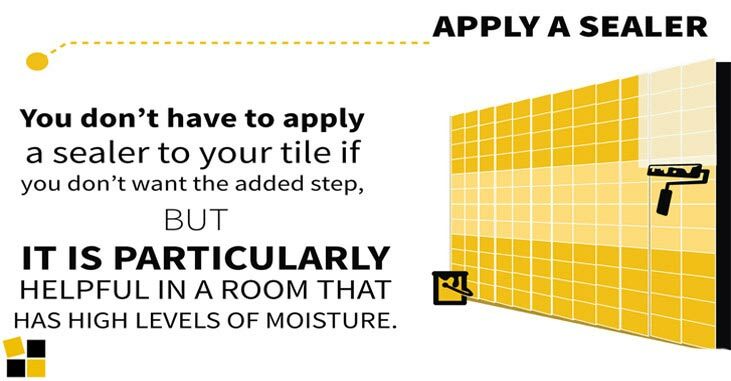 This time, instead of applying a layer of adhesive it is better to apply the adhesive straight to the back of the tile in a technique known as back buttering. Once all of the tiles are fixed into place leave the adhesive to set for the recommended time. Once dry use a grout float to fill in the gaps between the tiles with grout, wiping away any excess grout with a wet sponge. Sockets on walls, above kitchen countertops for example, can put many people off having a go at tiling the wall themselves. But it really shouldn’t prompt you to pick up the phone and call in the professionals because tiling around a socket is easier than you may think. The main concern that people have is disrupting the rest of the design by making small cuts of tiles to fit around the Socket. We advise you on how to create a style which flows seamlessly even when around a socket. For this we cut a section out the tile itself which provides a slicker more professional look, opposed to having to contend with additional and unnecessary grout lines. 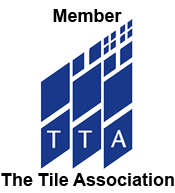 To get the correct measurements, tile up to the area in which the socket is located. Then switch off your electricity and remove the fascia, exposing the bare connections underneath. With the tile which you are going to fix over the socket, trace the outline of the socket on the tile itself with a pencil. By removing the fascia and fixing it back on when the tile is fixed it will eliminate the chance any gaps between the tile and socket being visible. Now it is time to remove the section you have outlined on the tile. With the tile saw, cut the two outer edges of the socket tracing. Then make parallel cuts between the two edges before removing the longer pieces with tile nippers. 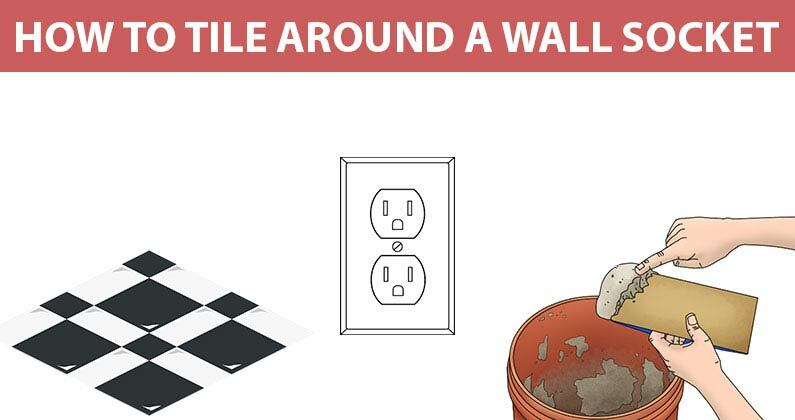 To remove all the tile within the socket outline, drill a hole in the middle and then use tile clippers to take out the remaining pieces of tile. The tile is now ready to be fixed onto your wall. Use a trowel to apply tile adhesive to the back of the tile and place onto the wall, making sure it lines up with the socket precisely. Once the adhesive is dry you can then screw the socket fascia back over the top and the job is complete. 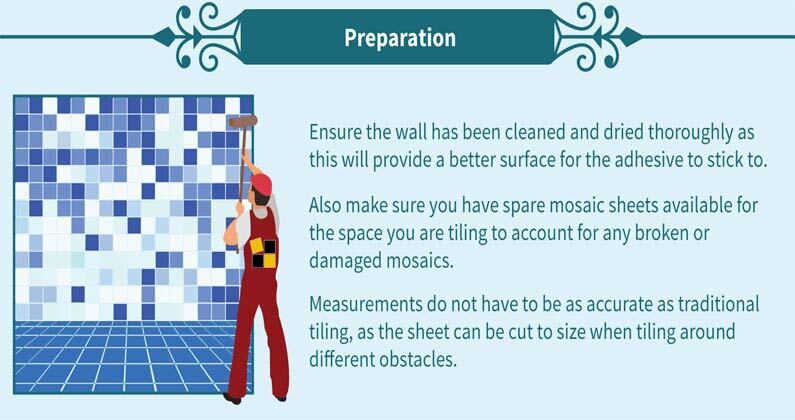 Make sure you prepare the surface first so that the wall is smooth, clean and suitable for tiling. Any broken pieces of mosaic can be peeled off the backing and replaced so firstly make sure you have spare sheets available to account for this. Mosaic tiles can be cut with a grinder. With mosaics the actual joints between the sheets are barely noticeable when installed correctly, which means that small cuts at the side of the wall or next to the ceiling do not matter as much as they do when tiling with standard tiles. Specific measurements are therefore not as important as the sheet can simply be cut to size when tiling over an obstacle like a light socket or when you have reached the end of the wall. Start by tiling in the bottom corner of the wall. Spread a thin layer of adhesive with a trowel in just the corner section and then press down a full mosaic sheet. Make sure this is straight and is aligned to the side of the adjacent wall and unit or floor at the bottom. To ensure the mosaics are level you can tap them down with a short length of wood. 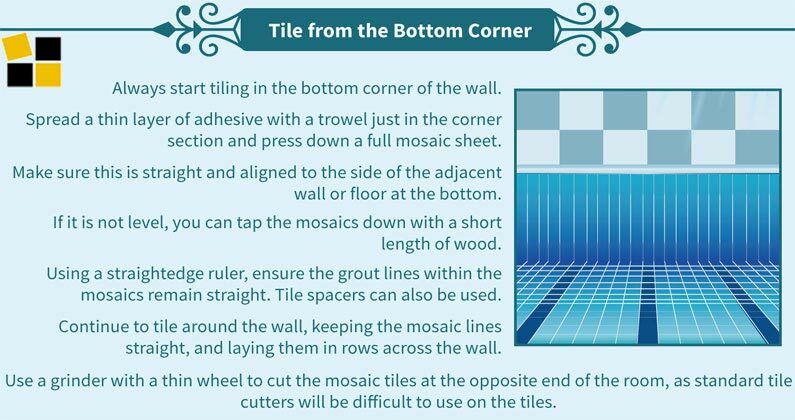 Use a straightedge ruler to make sure the grout lines within the mosaic sheet remain straight. Tile spacers will help to keep the mosaics an equal distance apart from each other. Continue to tile around the bottom of the wall. 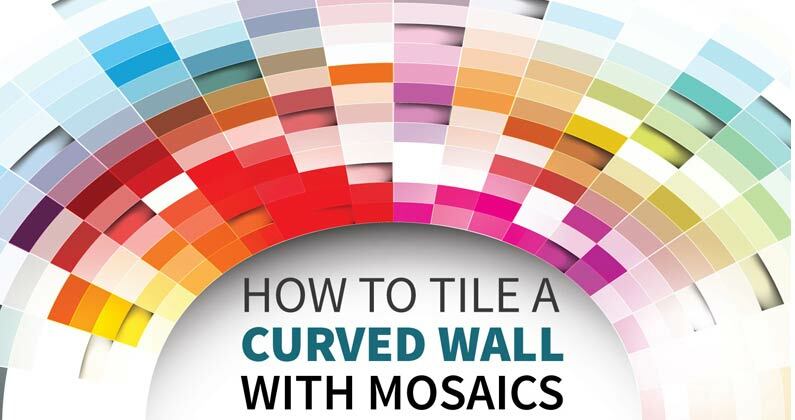 Because the wall you are tiling has a curve the tricky part will be keeping the mosaic lines straight but as long as you take your time you should be fine. Lay tiles in a row across the wall. At the opposite end of the wall from where you began tiling you will have to cut the mosaics to size. You will find it difficult to cut these tiles with a standard tile cutter so we recommend you use a grinder with a thin wheel which is suitable for cutting through concrete and stone. Once you have fixed your mosaic sheets to the curved wall leave the adhesive to set for the recommended time. You can remove the tile spacers before the adhesive is completely set to avoid them becoming stuck. Grouting mosaics can be a difficult and intricate task. It can also be rather time consuming with the amount of grout lines involved. Furthermore, you require a greater quantity of grout when tiling with mosaics than you do with standard tiles. Use a grout float to ensure the grout is applied within the gaps smoothly. Remove any excess grout from the surface of the mosaics with a damp sponge and leave the grout to dry. You need to accurately measure the centre point or apex of your arched opening and draw a vertical centreline at this point. 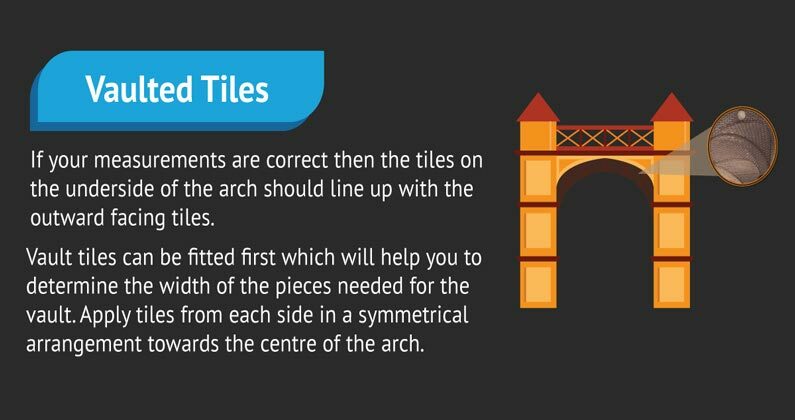 Arches need to look symmetrical so this is one of the most important steps underpinning the success of your tiling project. Depending on the curvature of the arch you may have a tile centred at this point or a tile either side of the centre line. 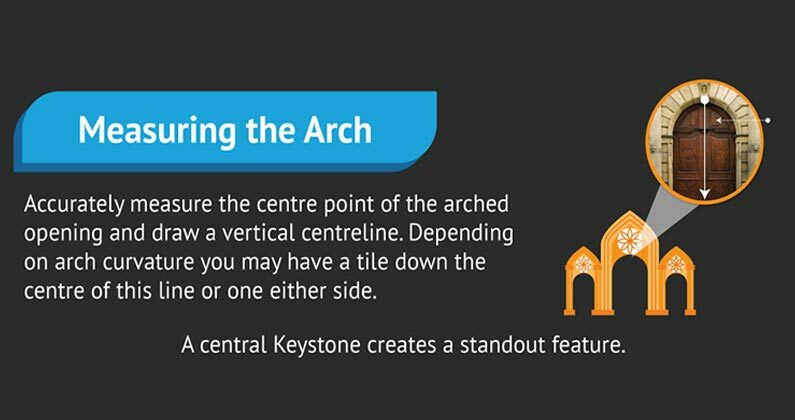 It is up to you to decide but a central “keystone” can help create an added feature around the archway. You need to decide on how the edge will be finished. 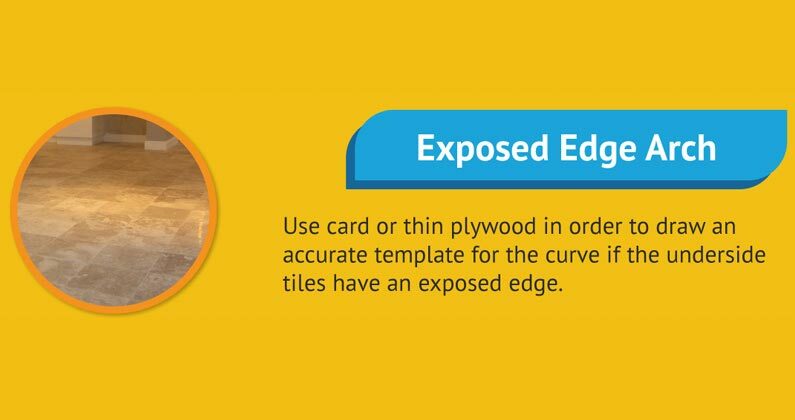 If tiles for the underside will have an exposed edge then you can draw an accurate template for the curve using card or thin ply and lay it on the floor. 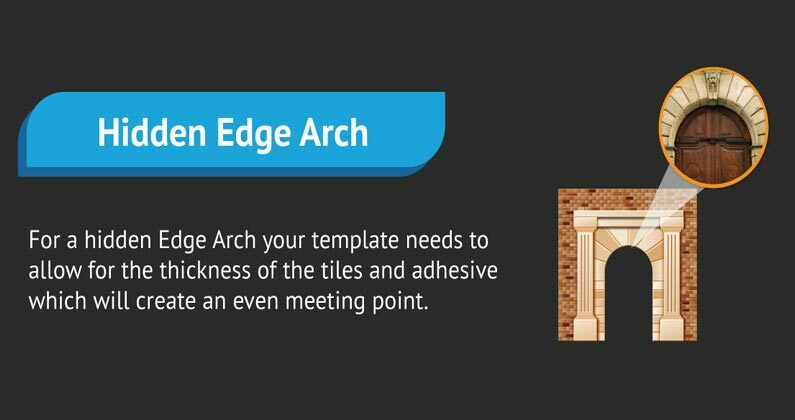 If the surface tiles will have their edge exposed meaning that the vault tiles are hidden then your template needs to have the arch brought-in by the thickness of the tile and adhesive. The arch can be measured accurately then the outer points and apex can be estimated for “overhang” and a second curve drawn parallel to the first arch with the new profile to accommodate the vault tiles. Make allowances for the flexible edging and grout to also accommodate the vaulted tiles and adhesive. If in doubt try a dry run with pieces of tile and trim fixed in place until you are totally clear on the dimensions of the curve you need to fit. Once the template is ready you can use it to construct an archway from lozenge shapes that create the effect you’re looking for. A book of cheap graph paper may help you create symmetrical lozenge shapes. Ideally they should be the same size or at least symmetrical while a keystone at the apex can be larger. Make sure to allow for grout between tiles. Remember that the vault tiles will be flat while you need to resemble a curve on the exposed face. The result may be a compromise to get the effect you want. Once you know the size and shape of your pieces then mark out the tiles. 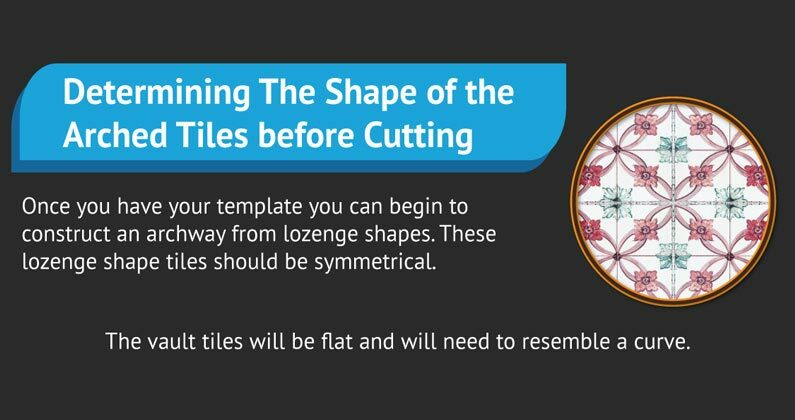 Cut the tiles and arrange on the template in case you need to make adjustments. Fit the face tiles to complete the outer arch. You may need to use tape and a temporary former spanning the archway to hold the tiles in place. 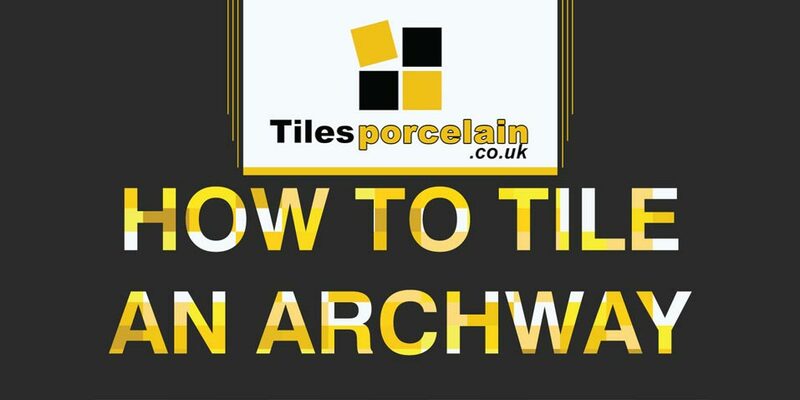 Ideally, the tiles completing the underside of the arch should line up with the outward facing tiles so you should work off the template to get the size of the tile slips you’ll need. If you prefer, the vault tiles can be fitted first. Your template and arrangement of facing tiles will help you determine the width of the pieces needed for the vault. Work from both sides towards the apex for a symmetrical arrangement. Cut edges can be chamfered slightly on the front edge to better fit the curve. Mark out the curve on the tile to be cut and use an angle grinder with a suitable diamond wheel to gently go over the curve on the front face of the tile. Don’t apply pressure but simply allow the rotating disc to do its job scoring the tile. Repeat the process on the back of the tile to complete the cut; being careful not to score or chip the tile surface. Try and keep all “overcuts” within the waste portion of the tile. Finish the edge using an abrasive stone or tile file. Square ceramic tiles are a good choice for tiling around archways. Furthermore, Ceramic Tiles are easy to cut and are also lightweight. Ceramics are available in many different styles and colours and therefore discovering a variety which complements your design theme is not difficult. Neutral colours like cream and beige are very popular for modern interiors. These colours match superbly with white, chrome and wood fittings which are a regular feature of contemporary decors. 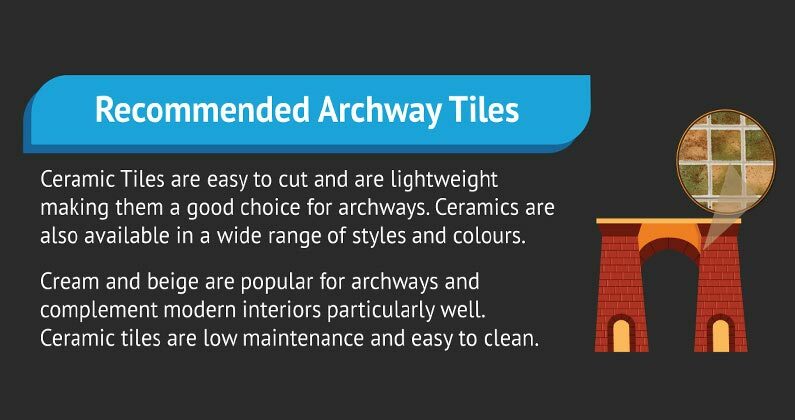 Ceramic Tiles are also low maintenance and easy to clean so they also have many practical benefits too.